Doesn’t look like a novice pie crust to me! 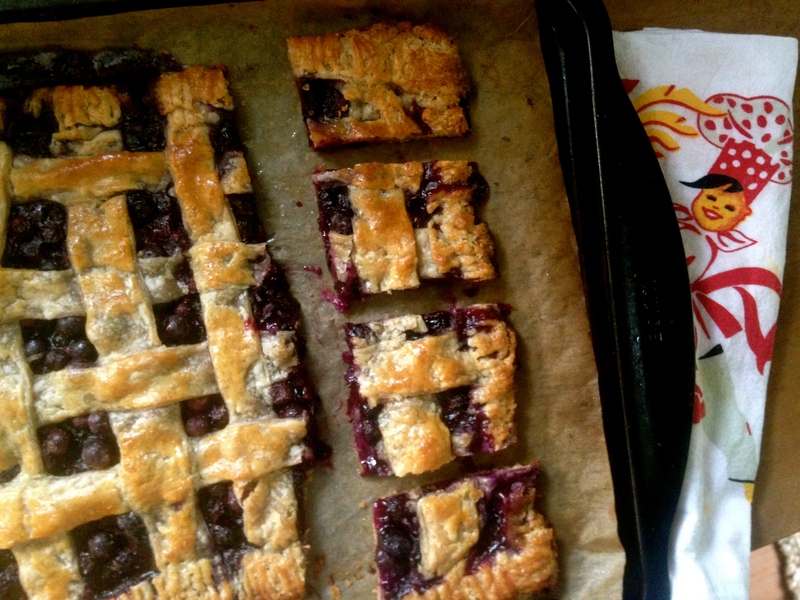 Love the rustic quality to the slab pie and that adorable vintage tea towel in the picture. Your home must have smelled divine with all these pies baking in the last 2 weeks! Yes! The house smells so wonderful with pies in the oven. I love it! I found it interesting how my pie crust turn out so much better if I keep it rustic, like a galette or this slab. Don’t know why I can not seem to pull off a good looking fluted pie crust. I’m determined to figure it out though! I love slab pie and really love the addition of rye flour in your pastry dough. The pie looks incredible and delicious. 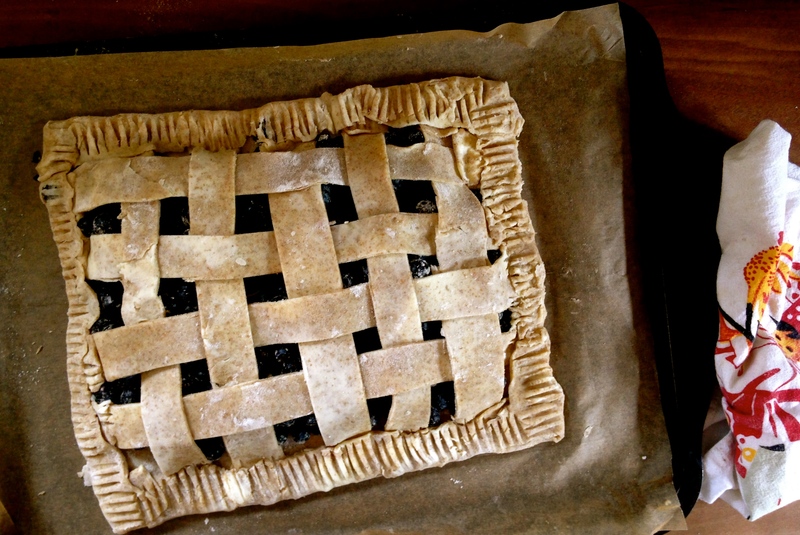 This pie looks rustically gorgeous. Just the way I like them! I’ll take a piece – looks luscious. Thank you Linda, it is a wonderful summertime dessert…especially if a scoop of vanilla ice cream is on the side. Heavenly. Very nice slab pie. I like the use of rye flour in the recipe and will give it a try. One tip I use is make sure everything is chilled before mixing the pastry – including the flour. I use my hands too, so when I have the time I chill it a couple of times before it is ready. I also use my rolling pin and fold it up rather than too much working with the hands. Sort of like making croissants! I tend to get into bother with the latticework. I’m like a kid tying his shoes. Lovely pie. You should have seen the first lattice slab I made. Apparently I didn’t pay attention to the lattice work at all and it looked like a kindergartener trying to make one of those paper placemats. And I didn’t even notice it until I saw the photographs! Dumb. Sometimes I wish I had a pie making machine. :) No, not really, but I am determined to turn out a good crust. Of the four pies I made in the past two weeks I actually tossed one in the compost. I was not happy at all. It kept crumbling into bits as I was trying to roll it out. And I had the filling ready to go. Ahhh, live and learn. Using any flour other then wheat flour to make pastry instantly makes it more temperamental. I’ve found that rolling it out between 2 sheets of baking paper helps when having to move and position the pastry, also i’ve been known to do away with the rolling pin and just pat it into the shape I want. I’m about to try out pastry with zero wheat flour, wish me luck!! Impressive! I haven’t bought rye flour in ages as I didn’t use up the last lot. Hadn’t even thought of using it in pastry. Tell me, does your pastry shrink? Maybe it’s because my flat is so damp, but every time I make pastry with water it’ll cause the pastry to shrink – badly. And I’m wondering exactly what the vinegar does. In cakes I think it gives it more lift. I wonder if pastry is flakier because of it. Huh, will have to try it! We are blogging on the same tangent today Seana. I made mini hand pies today with Apple filling and chocolate filling. I too add vinegar to my dough for extra flakiness and crisp texture. Love that blueberry slab. Oooo. I love hand pies! This slab cut so well you could eat it by hand. Adding vinegar to the dough was a new concept for me and I’m thinking it may be a little secret to ease the handling a little. I’m heading over to see your post but do you make your dough by hand too? Love the way your rustic pie crust looks, that to me would smell and scream homemade. I have heard about adding vinegar to dough to make it more flaky, have not tried yet. Have a great week-end! Oh my goodness Cheri…it’s so nice to hear from you this evening! Thank you so much for stopping in. It’s been too long since I have visited your blog. I seem to get stuck on the wordpress reader and don’t venture too far from it. :) I’m headed your way to check in and see what you have been up to lately. Your slab pie looks delicious. I will tell a friend of mine that loves to make pie about the vinegar or vodka and adding rye flour. What a great tip. Thank you! I don’t know what has come over me. Suddenly I have this need to know how to make a good pie crust. I remember my mom being able to turn out a good crust without even following a recipe and maybe even without using measuring cups! We’ll see how many I can make over the weekend…hope your weekend is fun! Wow that is one gorgeous pie!! Love the use of rye! Hi Seana – I too like the first comment thought rustic ad hearty and homely rather than novice when I saw this pie! Lately I’m trying to experiment with different flours, so thanks a lot for sharing this! It looks very yummy! The use of apple cider vinegar is brilliant! I’ve been using different flours too! Not only in pie crust but also cakes. It’s so interesting to see different results in various flours. 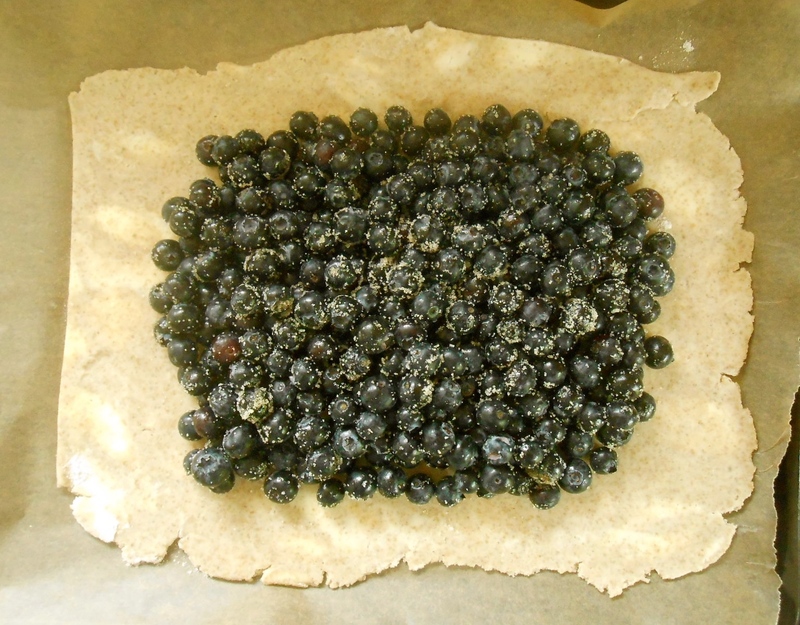 I made a pie crust with oat flour the other day too. Haven’t had great results with coconut flour yet. It’s an interesting study… :) Thank you Margherita! Seana – you’ve outdone yourself. I absolutely love this recipe – this post – the photographs. Beautiful. All of it. You are too kind Lindy! :) Thank you so much for your nice comment and encouraging words. Every time I click the publish button I get a twinge of doubt, like the post can be so much better and hearing your feedback is a good dose of confidence! Enjoy your weekend, hope your weather is lovely. 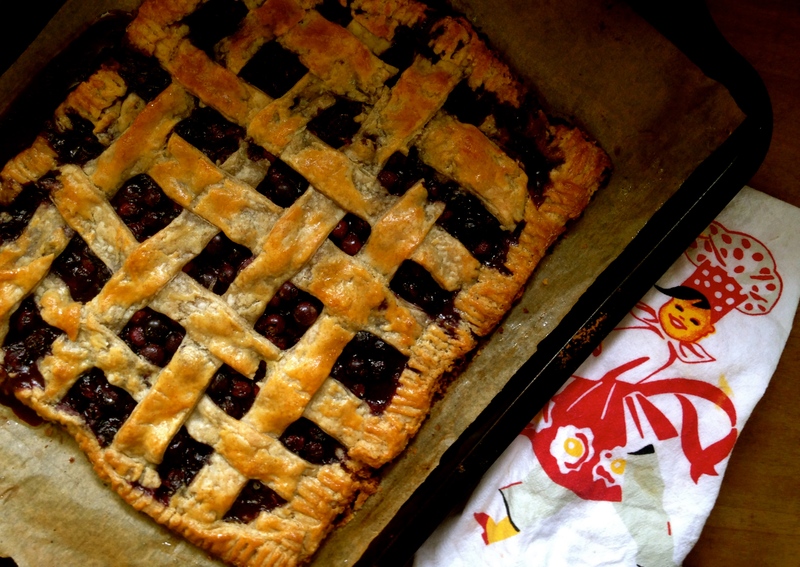 Hi Seana, your rustic blueberry pie is beautiful. I have never heard of using vinegar in crusts before but I will definitely try that next time. Also love the idea of using different flours. Great post, now I want pie. You are super precious! Your blog makes me want to cook more! Time is my issue with so much going on but I’m making a point to squeeze some cooking in that’s picture worthy! You made my day. Enjoy yours! You don’t need any tips!!! This is absolutely gorgeous, and not it a perfectly manicured way. I love the rusticity – right up my alley!!! I think this is a gorgeous pie! My mouth is watering! The crumbliness is probably due to a lack of enough liquid. I don’t know if this helps but I put most of the water into the bowl but hold back a little bit, then toss it with a fork. then I dump it all onto the table. You have the right trick with the larger and smaller lumps. But to judge if there is enough water I give the dough two or three schmears and gather it back up basically pinching it all together. I can then look at it and if it is dry anywhere I sprinkle those area only with a bit of water. I find I typically need more water in the winter and when it’s dry and in the summer the flour holds enough moisture from the humidity in the air so I usually don’t need quite as much. Anyway, here’s a link to my empanada dough in which I use that exact same method. Of course, you probably have it all down by now! I can’t wait to try your pie! Unbelievably helpful! Thank you so much. It makes so much sense about the lack of water. The two slabs I made (which were the greatest success) I thought weren’t going to turn out because the dough seemed too wet. It didn’t dawn on me until you mentioned it this was exactly what made it work. I’ll go back to the baking board and use your advice with adding a bit of water on the dry area. And no…I don’t have it all down by now, still working on it! I’ll head over and take a look at your empanada dough. I love empanada’s! You are too kind to share your tips and knowledge! Thank you. Well, thanks! I hope it helps and I was afraid I gave too much advice like an old fuddy duddy! :) It’s all kind of a touchy feely thing and it just takes time to get to know where it should be. You are currently reading blueberry rye slab at COTTAGE GROVE HOUSE.